Everyone back home and all duded up for a ho-down! We looked like an old west family as we headed to the barn down the road for dinner, a sing-a-long and some square dancing. L&I got to do the Virginia reel and then Jack stepped in and danced with L the rest of then night. 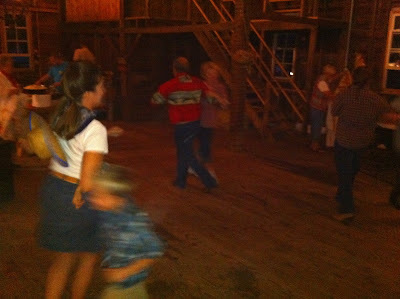 After 2 sets of multiple square dances people were packing up. J went up to the Caller and asked if there would be anymore dancing. The guy told him if he could find enough people they could dance more. J took off into the crowd of adults and pulled 3 more couples and L to the dance floor for one more dance. Back home and all boys clnd up ready for bed. After a couple Lego Star Wars Bible stories on YouTube we got them to bed. 101016 + HAPPY 4th BDAY GRANT!! !